Finally! Lovely collectible Susan Branch Cups, stamped on the bottom "Fine Bone China, Made in England." 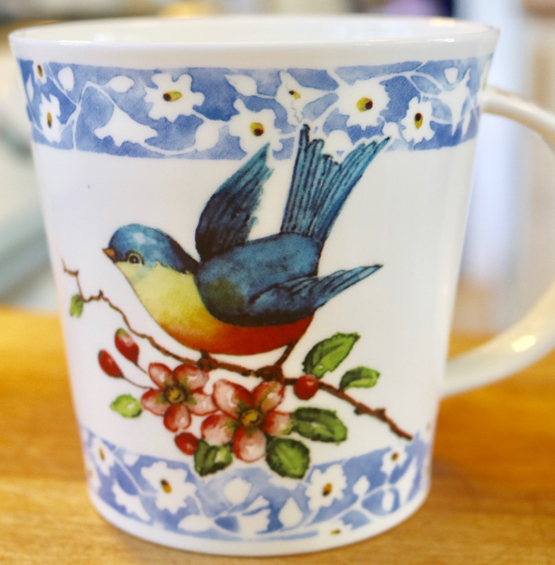 Imported from "the potteries" in Staffordshire, England; 16 glorious ounces (filled to the very top), perfect for tea, coffee, hot chocolate, soup, stew, and Irish coffee (plenty of room for whipped cream), with Susan's charming art on front, back, handle, and bottom of each cup. Dishwasher and Microwave Safe. Four new designs: Bluebird, Martha's Vineyard, Santa (all 16 oz. ), and for those who requested something slightly smaller, our new 11oz. Autumn cup. (Each cup is sold separately, OR (less expensively), in a group of three that includes Bluebird, Martha's Vineyard and Santa ~ Autumn is sold separately only). We plan to bring out new designs and retire the old ones, so that Susan's lovely work becomes even more of a treasure, and collectible because of the smaller runs. For UK customers: Save money on shipping from the US and order locally from Nursery Thyme in Devizes Wiltshire ~ through their online store at https://www.nurserythyme.co.uk/?s=susan+branch&post_type=product. You can also contact their retail store by calling 01380 721747. Cups are available in limited quantities, just as they are in the States, and when they're gone, they're gone.